When you go on vacation, chances are that you’re looking for the best restaurants and most delicious local dishes. Sometimes, you have no idea what to expect or where to go, but from the 15th through the 31st of May in Puerto Vallarta that won’t be a problem. That’s when Puerto Vallarta Restaurant Week is held, and it’s an event that has been attracting locals and tourists since 2004. Perhaps you’re familiar with the concept of Restaurant Week, which is already popular in other major cities around the world, including New York, San Diego, Chicago and even London. Surely you’ve asked yourself, “What exactly is Restaurant Week and how does it benefit me?” Restaurant Week is an event during which some of the best local restaurants offer a three-course menu with three options each. The goal is to provide restaurant goers with affordable pre-set menus that range in price from $199 to $299 pesos per person. It’s a fantastic opportunity to sample new dishes and enjoy a unique experience. As you can probably imagine, Puerto Vallarta Restaurant Week has been a success since its first year. The format of “set menus” at previously established prices has become popular outside of the event dates as well, and since many tourists find these prices particularly attractive, it’s a great opportunity to enjoy a romantic dinner in Banderas Bay. 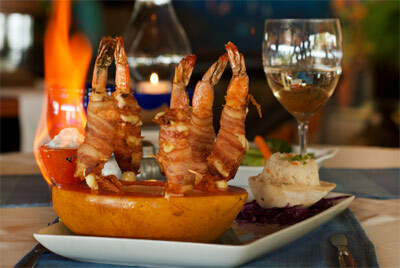 Besides, what better way to end the day in Puerto Vallarta than to share a delicious meal with that special someone? The government restaurant and food industry trade organization, CANIRAC, works closely with the event organizers to increase the number of participating restaurants each year. When you visit Puerto Vallarta or Nuevo Vallarta in May, be sure to ask for a list of participating restaurants so that you can book your dinner reservations in advance. Some of the most well-known restaurants to have participated in the event include Milk (contemporary cuisine), River Café, (International), Porto Bello (Italian), Nicksan (Japanese) and Si Senor (Mexican). This is just a sampling of the wide variety of cuisine that you can enjoy during your next vacation in Puerto Vallarta.